Welcome to the online home of JD's Dogs. 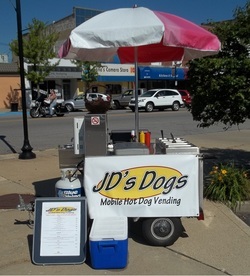 We are a hot dog vending business that caters to both public and private events. Founded in June of 2010 by James "JD" Archer, we have brought the word "Quality" back to street food. All of our ingredients and toppings are freshly prepared each day and the company motto is "Quality First!". In this way we take pride in delivering great tasting hot dogs to our guests. NEWS: We have closed due to unforeseen problems. We hope to return to the area in a new form within the next couple of years. Thank you for your patronage.